Magnetic signs offer a versatile and alternative way of advertising. A magnetic sign is made of 0.60mm or 0.85mm thick magnetised rubber sheet that will adhere to metal surfaces. Your design is digitally printed onto vinyl were after it is applied to the magnetised rubber. If you use your car or truck and don't want to do permanently lettering onto your entire vehicle, a magnetic sign is exactly what you need. They are available in a variety of sizes. 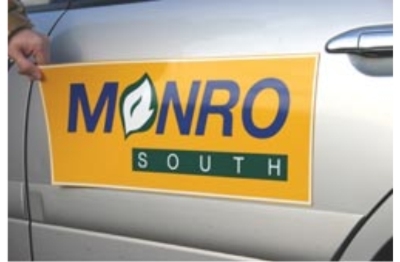 Our magnetic signs are made from a magnetised rubber that will stick to your vehicle in the most extreme conditions. We make car and fridge magnets with your customised design to enhance your company's image and generate that extra business. Both the vehicle and the backside of the magnetic sign should be clean and dry prior to application. Let one edge of the sign contact the vehicle in the desired position. Then let the force do the work as it positions the sign in place from starting edge to opposite edge. If the sign is out of position, peel it off and repeat. Make sure the sign is smoothly against with no trapped air underneath. Magnets will not stick to non-metallic vehicle bodies or components. If your vehicle has been recently painted, it is recommended that you wait 90 days for the paint to cure. Remove the sign weekly and wipe dry both the vehicle and the sign this keeps moisture from collecting which can damage a vehicles finish. To wash the back of the sign, use warm water and a mild non-abrasive detergent. Remove sign after rain, wipe dry and reapply. Also, remove signs before pressure washing. Note: Magnets left on a vehicle over extended periods of time may become difficult to remove. Also, magnets left in direct sunlight on a regular basis, if not removed and cleaned regularly, may become bonded to the paint surface. Signs must be stored flat. Place heavy objects on sign face. Do not store face to face unless a slip sheet is used.